Twenty-five years ago, Maison Martin Margiela launched one of its most important pieces. 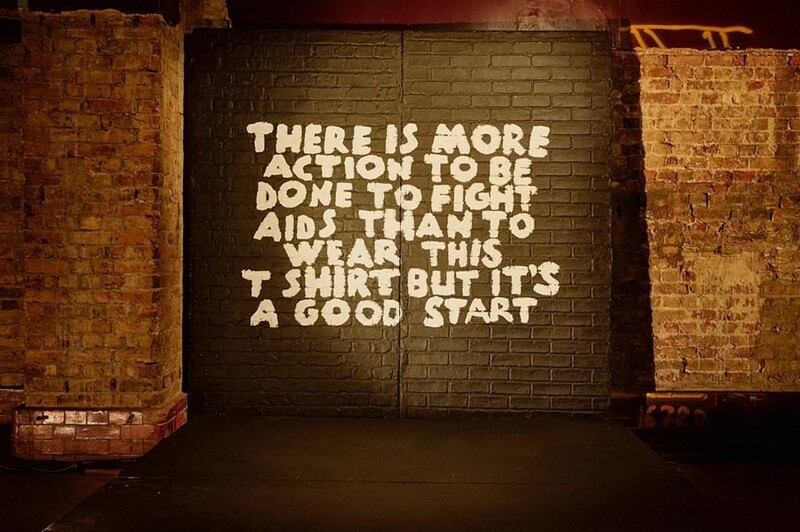 A simple v-neck t-shirt, the garment was identifiable by its screen-printed slogan: “THERE IS MORE ACTION TO BE DONE TO FIGHT AIDS THAN WEAR THIS T-SHIRT BUT IT’S A GOOD START”. With profits going to French organisation AIDES, the t-shirt has been reissued every year since its AW94 debut, and has been reimagined in a variety of colours and languages. 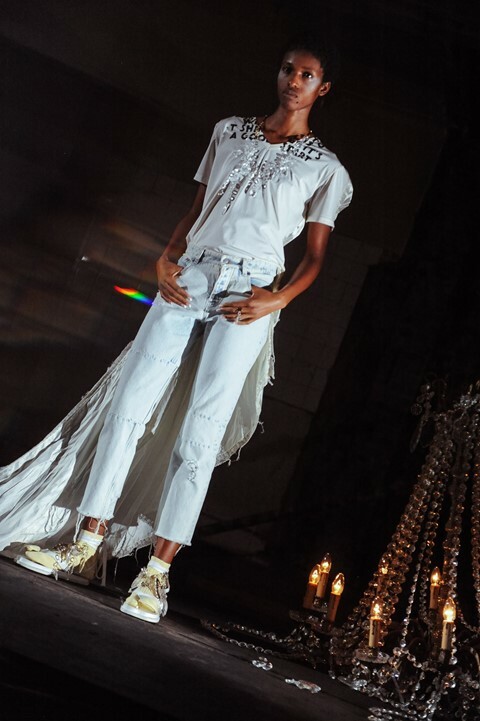 To honour the anniversary of this partnership, Margiela’s MM6 SS19 collection put the familiar slogan centre stage – printed as it was on the exterior (and interior) of garments including velvet dévoré Japanese bags, flare-heeled ankle boots, brass cuffs and vinyl shopping bags, as well as the classic t-shirt. This week marks the online launch of the tee’s 25th-anniversary edition – here are four key things to know about the Margiela/AIDES collaboration and the original design that launched it. In America and Europe, the devastating effects of AIDS and HIV were felt throughout the fashion industry almost immediately. Kenneth Cole, Anna Wintour, Donna Karan, and Ralph Lauren were some of the first fashion figures to offer their support towards fighting the disease, while, with the debut of the t-shirt as part of its AW94 collection, Margiela became one of the first fashion houses to launch an ongoing initiative with an AIDS charity. AIDES, an organisation dedicated to “fighting HIV, AIDS and viral hepatitis”, was founded in 1984, but nevertheless, ten years on, “the death rate from the AIDS virus was at its highest,” a spokesperson for AIDES explains. “There was no efficient or effective treatment, with doctors only being able to ease the pain – trying to help patients die with dignity. The first effective treatments did not come in to the public domain until 1996.” Thus, when the esteemed Maison became the first fashion brand to support the foundation, it was a landmark moment for both AIDES and its cause. It is difficult to find any comment about the collaboration from the famously elusive Belgian designer in any of the rare interviews he has conducted. But, in an email thread between British designer Malcolm McLaren and Margiela (writing as the “Maison” rather than “Martin”), published in T Magazine in 2005, a little light is shed on the topic. Margiela, speaking of the recent death of Susan Sontag, writes, “[Sontag’s 1989 book] ‘AIDS and Its Metaphors’ was such an important work. It shoved us along in our grudging recognition and understanding of H.I.V. and the isolation it brings. It is numbing how that virus has tricked, mutated and infiltrated. We always feared it would become a pandemic, yet who in 1987 could have predicted the desolation and devastation it would reap in Africa? (Journalist Randy Shilts’ seminal book) 'And the Band Played On' seems so far away today.” It is clear that the cause is one that had resonated heavily with the Maison, and it was unsurprising to learn – during Margiela’s retrospective exhibition in Paris last year – that Margiela personally designed the t-shirt himself. The most important element of the t-shirt’s design is the manner in which the text is applied; a display in the Paris exhibition filled in the background of this. Margiela opted to have the slogan, written in English by Sophie Pay (a member of the sales team and daughter of Margiela’s creative partner Jenny Meirens) and Axel Keller (MMM’s commercial director), screen-printed onto the shirt while it was folded. The result is that the text is illegible when worn, prompting questions from passersby about what it says, and what it means, sparking further conversation. More information on AIDES' work can be found here.